Usually I plan my halloween costume weeks in advance. However this year I was having a problem coming up with the right costume to suit my fiancee(Joey), and I. We were down to two weeks before the Halloween party we were attending, so I started gathering ideas online. 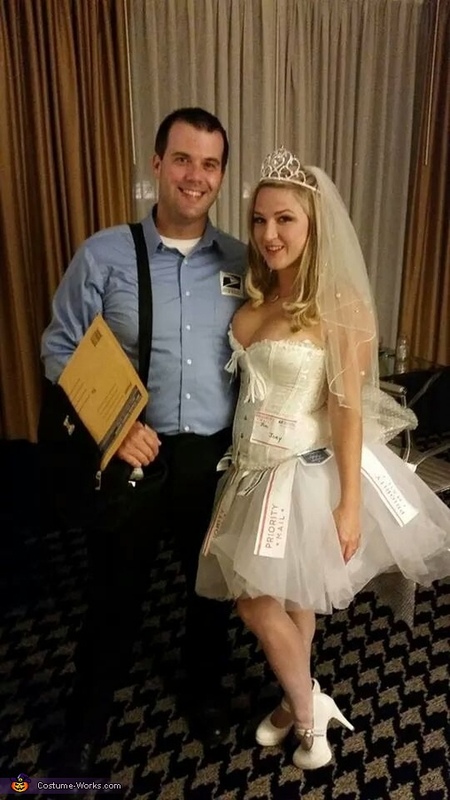 I found a picture of a mail order bride and thought it was very fitting being as I am getting married next year. First I ordered a white tutu ($10), then I ordered a white corset($19). I also ordered white stockings($4), a cheap veil($5) from ebay, and bought white shoes($33) from Party City. I gathered postal supplies at my local post office for free. I cut strips that said Priority Mail and sewed them onto the tutu. I added a to / from sticker. I added a tiara from my daughters dress up collection, and my costume was complete. For his costume, I found a light blue shirt from Goodwill($3). I bought iron on transfer paper from Walmart, and printed a postal patch online. He already had dark blue pants and black boots, a black bag and mailing envelope. After he got dressed I kissed him on the face with my bright pink lipstick and we were ready to go..